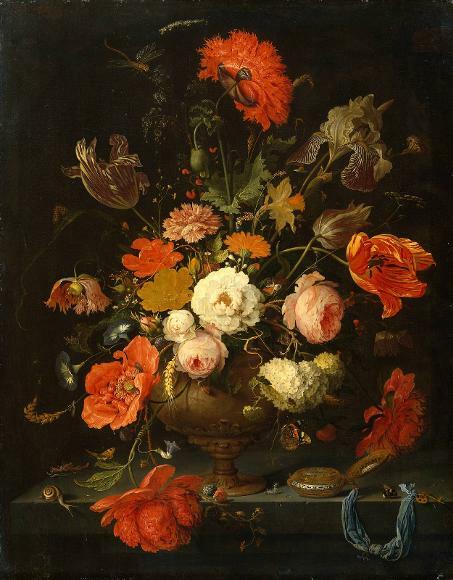 I’ve always wanted to be able to paint those lush flower paintings that you see in the museum. Big fluffy roses and peonies. Those ones that are a kind of Vanitas – capturing the fleeting perfection of a bloom. 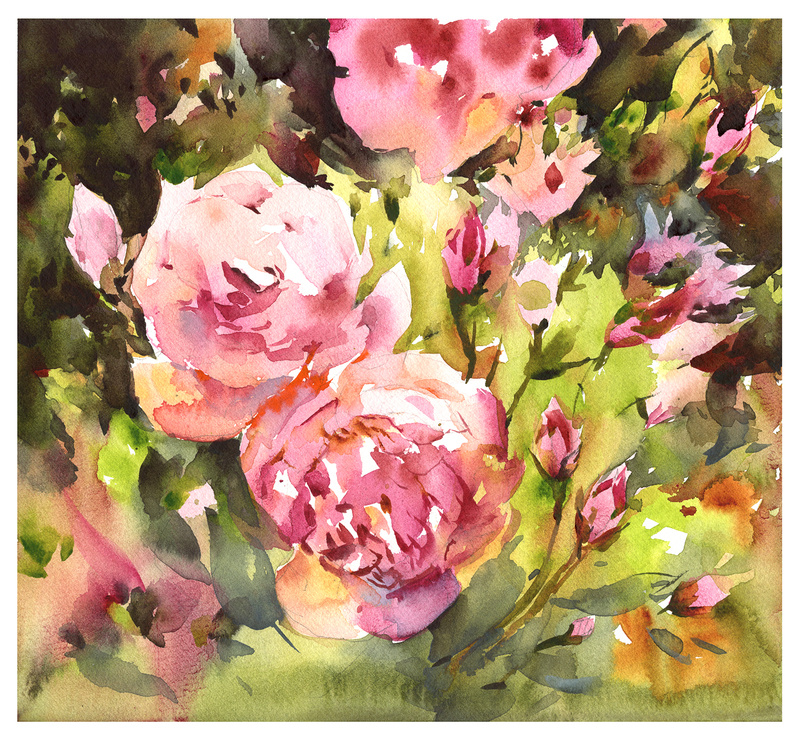 After the NYBG outing, I felt I hadn’t really gotten to the meat of painting a flower (as it were). So I’ve been trying it out some more in the studio. I feel like I need to make the paint handling instinctual, so I can work towards a more serious effort at a real vanitas sometime in the future. This is a small sketch, on a leftover scrap of paper, about 11×12″. My home color is Quinacridone Rose, tinted with a variety of things. 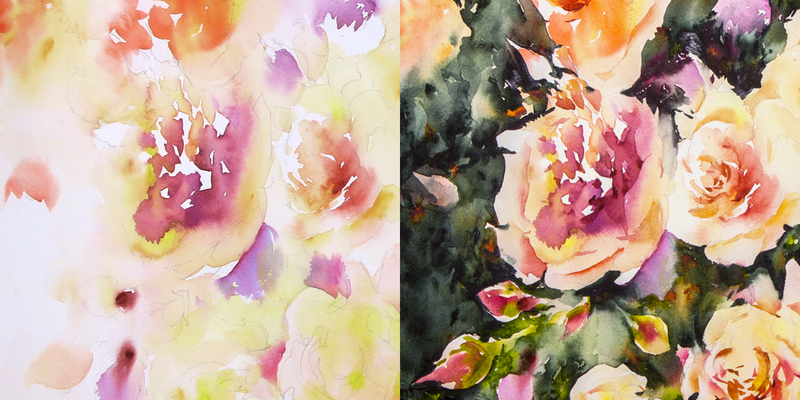 Just like last time (my roses from life), I started with the bright clean color of the blossom, then came back around with dark foliage. I’m looking to make all the soft edges inside the bloom in a big rush of broken brush marks – so they fuse wet-shape to wet-shape into the ‘ball’ of the rose. My mantra: “Draw with the Edges, Paint with the Insides”. 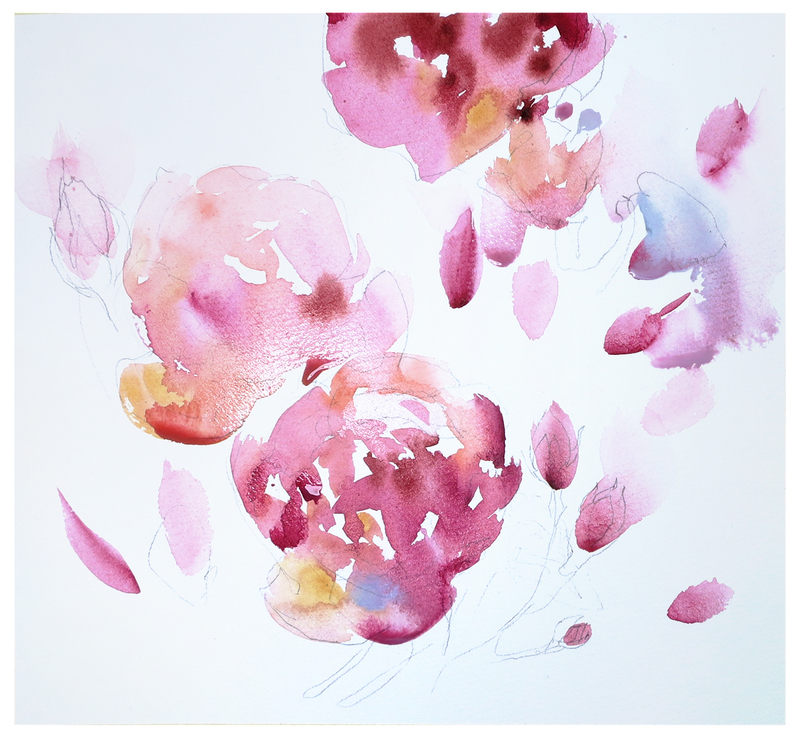 I can come back after they dry with the fewest possible dark strokes on top – to imply separation between petals. Not perfect – but I’m enjoying the feeling. As I’m doing them, I’m remembering any success I had out in the field came from working quickly, without much concern for how it turns out. Let the petals fall where they may. That seemed to go fairly well – so I scaled it up to a full sheet (22×30″, 200lb fabriano artistico). This time my home colors are Pyrrol Orange and Naples Yellow, tinted with a variety of things. 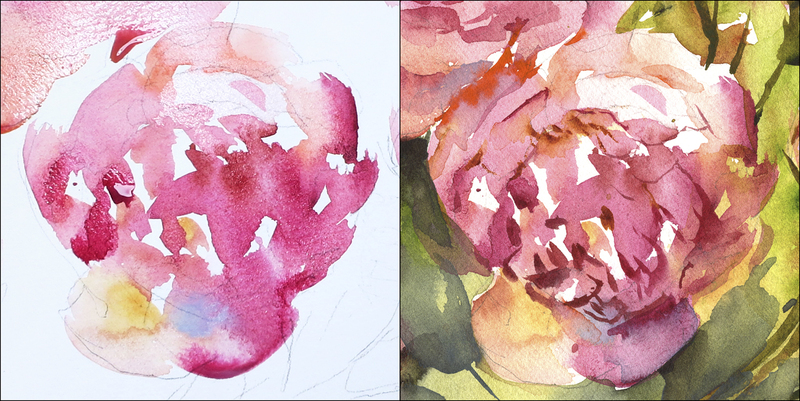 Here’s a progress shot showing the first pass of wet-on-dry blooms (on the left), and the second pass of the dark background marching across the page. Remember. I start with the paper bone dry. But this time, I pulled my first touches further, dragging color out with clear water, making the proto-blooms softer and brighter. Trying to leave myself more options for re-building petal shapes on top, and for cutting into the flower with the background. I’m not making an attempt at a botanical study here. Much as I admire that kind of faithful accuracy in other people’s work – today I just want exuberant color, and a lot of ‘random’ watery effects (Not random of course; by now I know what I’m going to get). I’ve got a few photographs on hand, but I’m really just looking at them for color suggestions. The shapes of my blooms are complete inventions. And I’m not making any attempt at painting actual leaves or branches into the background. I’m quite pleased with the final effect. Considering it’s my, what, fourth or fifth try with a floral subject? I find this one to be graphic and painterly at the same time. It’s one step toward abstraction. 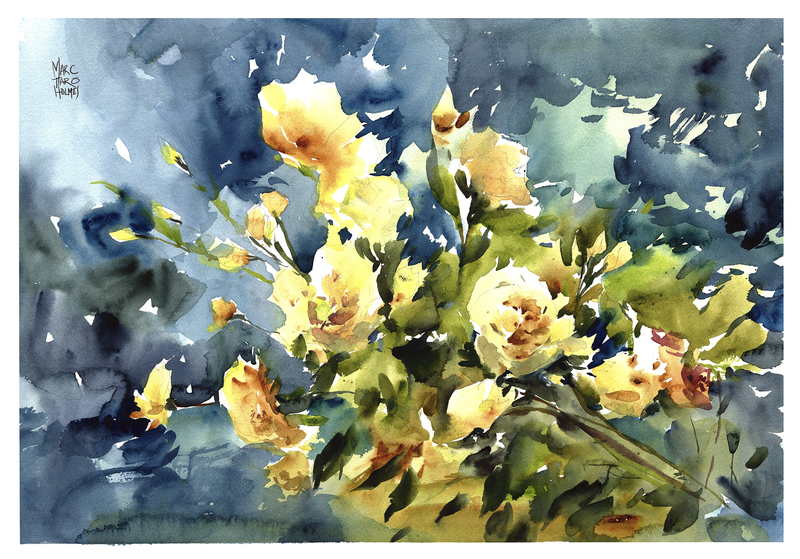 I think a floral painting allows me to do this – I don’t feel compelled to describe something ‘correctly’ – like I might do with an urban sketch of a specific place. Much like painting rocks and water, or trees, or any natural subject – there’s less need to get it specifically right, and more opportunity to learn the language of the brushwork. I think the next step is more work from life. To get more of a feeling of the full, fluffy roundness of a bloom. Looking forward to more experiments – but it’ll have to be later in the year, as I’m about to do a serious dive back into street-sketching, in preparation for the Urban Sketchers symposium in Chicago. Looks like you are really painting your feelings about the corals, I do abstract drawings and they are not about representing real things…I feel you are successfully combining the images of the flowers with the feeling.. This is what attracts us to urban sketching, it seems, capturing the emotions and somewhat what the “real” thing looked like.. See you soon in Chicago. I am in your Thurs workshop. I paint a lot of flowers and the anatomy is so complicated and can look stiff. I like the effect of the watery pink shapes leaving you the option to carve out the flowers in a design pattern with the dark background. It looks so soft and watery as you would want a watercolor to look. Love it! Awesome! Thanks for the detailed description of your progress along the way to a finished piece. Thanks for the conscious effort to stop and explain your steps. I appreciate the beauty of your work and the beauty of roses in bloom. These pieces are fabulous, your colors are vibrant and very realistic. 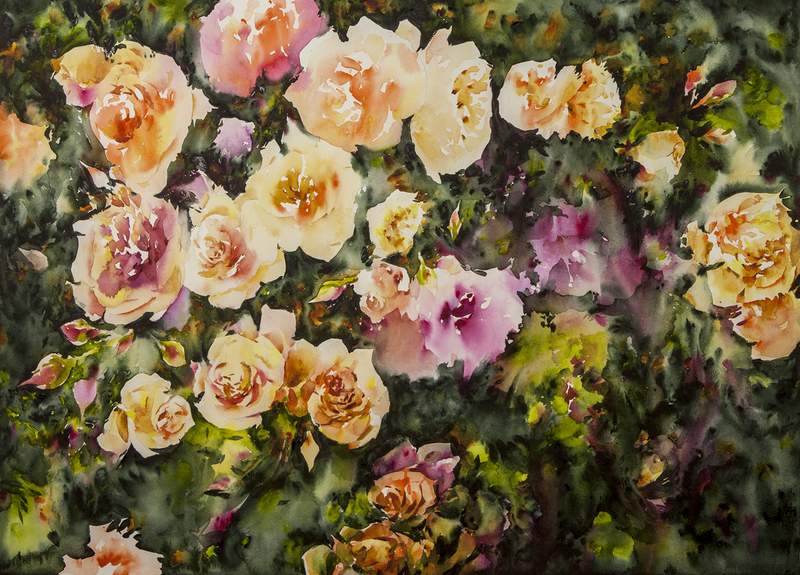 Your lower left corner in the final painting, the two roses in the bottom two rows, each one rose to the right, atop one another — exquisite! Nice job. So hard to stay loose when paintings flowers. What brush did you use?! Thanks. #3/4 DaVinci Artissimo, Mop (Mops have strange numbering. This is really almost the same size as a #14 pointed round). #7/8 Winsor and Newton Artist’s Watercolor Sable Pointed Round. These seem to come in long hair (my choice) and shorter hair, with no visible difference in the labeling on the brush, so you just have to compare. Thanks. Thought u might be using a mop. I use mine when I get to tight. And yes they have odd numbers. Y know what you mean. I have a ten I use a lot. Long Davincci sable. Also have a shorter version in a Richeson. Never use it. Thanks for sharing Marc! And the process description is very helpful as well. Love the ‘lushness’ of the blooms and how I ‘hear the garden growing’ when I look at the blooms. When you say this next word please put a French accent to it – Famtastic! 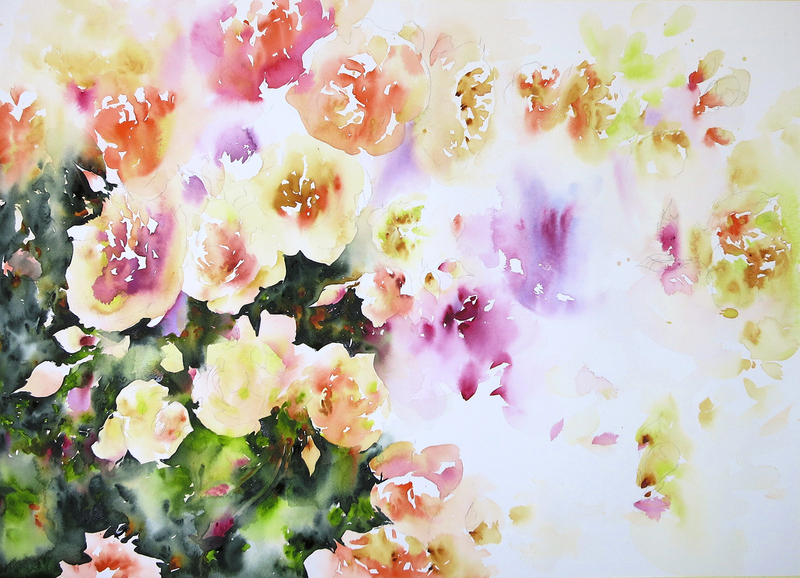 Marc Taro, this is gorgeous watercolour paintings! Fun to see how you handle a somewhat different subject for you. Thanks for the progress photos. This came out really nicely!